Fugly Horse of the Day: I hear you! I had to laugh. Saddlebred Rescue's Nealia posted what she called her version of this blog and I couldn't agree more with what she had to say. "Wouldn't you love to give Cindy a home for Christmas! This is a retired thoroughbred, she is very sound, and gentle, but she still has a lot of fire in her, in other words she would need an experienced rider. I've put her on craig's list twice but continue to get inquires for riding her with children or beginners. Cindy really needs a good home, we can not afford to feed her and are pairing down our animals due to the economy. 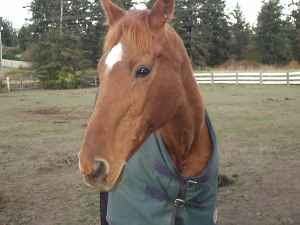 I contacted horse rescue legues who say the market is flooded with unwanted horses and I should put her down!!!!! This is a very nice mare, won several races in California, good companion and weed control for pasture. If you've been looking for a good price on a great older horse, bring your trailer and have a happy holidays. " OHHHH NOOOOES! Those MEANIES at the horse rescue said I should put her down! 1) You cannot afford to feed her. Well, join the club, honey. The economy has given most people a pretty solid whack. The guy down the road from you isn't rolling in money to support your discarded pets, either. 2) Do you know how many good homes I have found for old, hot TB mares? One. Ever. Lifetime. If I take one in, I assume it's a lifer. I happen to like old, hot, red-headed TB mares but my experience has shown me that is not a common preference. In fact, I'd say as a rough estimate, there are probably 100 or more old, hot TB mares desperately looking for homes in Washington state right now, and maybe 2 or 3 homes that can squeeze one more in, and actually have the knowledge level to properly feed, handle, care for and ride an old, hot TB mare. The picture is pretty damn bleak. 3) If the thought of a gentle, veterinary-assisted euthanasia horrifies you, I would recommend watching some video of slaughter in Mexico to put things in proper perspective. Again, once you let that free hard-to-place horse out of your hands, unless you are very, very careful (some tips on finding a good home here) and sometimes even then, that horse has a very good chance of winding up at New Holland, or Enumclaw or any one of a couple hundred similar auctions, and going straight to a Mexican vacation they won't be enjoying one bit. I have heard people say "oh, let them go to auction - at least they have a chance." Really, is that a gamble you want to take? Here are the options - a veterinarian quietly puts them to sleep at home. The horse is calm, not scared a bit, and is off to la-la land and oblivion without any hint that anything bad is happening to him. Remember, it's a horse - not a person. It doesn't know it's being euthanized. Then there's the alternative. The horse goes to the auction and goes to Joe Kill Buyer, or it goes to Bertha BigHeartandNoBrains who doesn't know how to feed a Thoroughbred and who will put her kids on it in a western saddle that sits on her withers and a $5 nickle plated curb bit from the farm store and send them out to the back yard to yee-haw around. The actual chance of being dragged home by a knowledgeable fan of old, hot TB mares is painfully slim. It's not a chance I'd want to take with any horse of mine. You know, ol' Casper won the lottery last weekend...but how many horses at the same sale lost? Food for thought. We can't rescue them all. We can't feed them all. We made too many of them, too many people dropped the ball on training them, the economy is in the toilet, and we're going to continue to see that euthanasia is the most ethical of the available choices. I know nobody likes it...I don't either, but avoiding reality isn't the answer. On a related note: Yes, I have heard that Madeleine Pickens is sure making her best effort to avoid what I see as the inevitable necessity of a lot of euthanasia. And I wish her luck. I just don't know how she will effectively administer the care of so many horses, many of them difficult and untrained. You know, all the money in the world isn't the only issue here (though it sure does help!) I still have questions about who is going to do the hands-on care. Who is going to do the training. Who is going to oversee all of this and make sure there is no train wreck? It is very hard to administer a huge animal sanctuary. Ask Best Friends! They do a good job but it is not easy and they've had their issues and growing pains like everybody else. What Ms. Pickens wants to do is exponentially larger than Best Friends and I can't help but see a lot of potential drama with staffing and ensuring consistent care. Hey, I hope I'm wrong. If she can get the right people on board, that will make all of the difference and she has the money to pay them. We'll see how it goes. I realize I may be too skeptical but boy, I've just seen so many of these "sanctuaries" go bad...despite people with $$ being at the helm. They weren't able to do the hands-on supervision and the on-site management dropped the ball. I don't know Ms. Pickens - I just hope she's not the trusting kind. P.S. One more thing about Cindy...WEED CONTROL? She's a Thoroughbred, not a goat!